“Arnold Newman: At Work” highlights archival materials from the Harry Ransom Center’s Arnold Newman archive to reveal a glimpse into the work of the photographer who created iconographic portraits of some of the most influential innovators, celebrities and cultural figures of the twentieth century. Written by Ransom Center Senior Research Curator of Photography Roy Flukinger, the book was published by University of Texas Press this spring. A bold modernist with a superb sense of compositional geometry, Newman is known for a crisp, spare style that situates his subjects in their personal surroundings rather than in a photographer’s studio. Marlene Dietrich, Harry Truman, John F. Kennedy, Arthur Miller, Salvador Dalí, and Pablo Picasso are only a few of his celebrated sitters. Rich with materials from Newman’s extensive archive in the Ransom Center, the book offers unprecedented, firsthand insights into the evolution of the photographer’s creativity. Reproduced here are not only many of Newman’s signature images, but also contact sheets, Polaroids, and work prints with his handwritten notes, which allow readers to see the process by which he produced the images. Pages from his copious notebooks and calendars reveal Newman’s meticulous preparation and exhausting schedule. Adsheets and magazine covers from Holiday, LIFE, Newsweek, Look, Esquire, Seventeen, Time, and Sports Illustrated show the range of Newman’s largely unknown editorial work. Flukinger provides a contextual overview of the archive, and Marianne Fulton’s introduction highlights the essential moments in the development of Newman’s life and work. 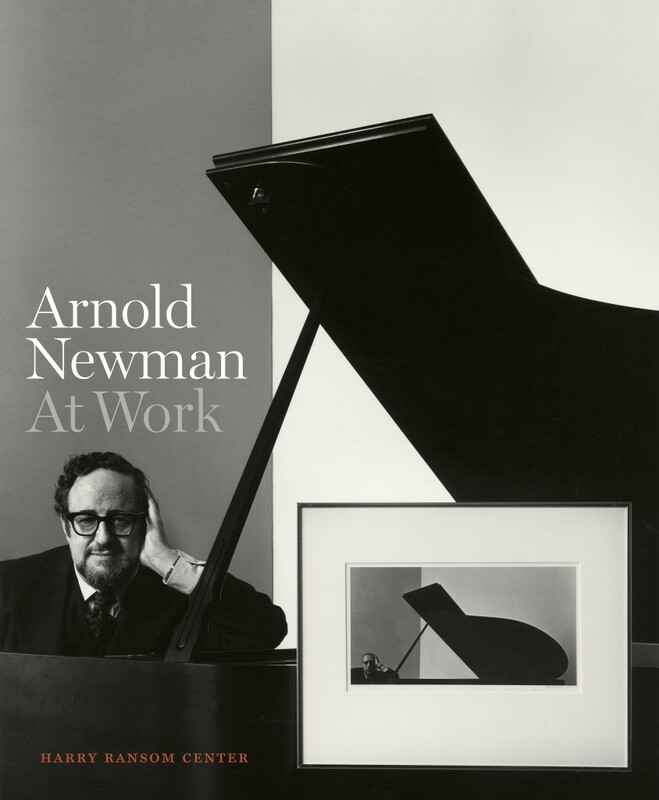 The book coincides with the Ransom Center’s current exhibition Arnold Newman: Masterclass, which runs through May 11. Featuring more than 200 of well-known masterworks, the exhibition also includes rarely seen work prints and contact sheets. Arnold Newman: Masterclass is the first major exhibition of the photographer’s work since his death and showcases the entire range of Newman’s photography, featuring many prints for the first time. From the Vietnam War to capital punishment, Norman Mailer engaged the important intellectual and social issues of his time. So it should come as no surprise that Mailer chronicled America’s space program and the 1969 journey of Apollo 11 in a three-part article for LIFE Magazine. Portions of the piece ultimately became Mailer’s book “Of a Fire on the Moon” (Little, Brown, 1970). As Mailer stated in a letter to Neil Armstrong on February 26, 1970, “I’ve worked as assiduously as any writer I know to portray the space program in its largest not its smallest dimension.” In “Of a Fire on the Moon,” Mailer searches for the moral and philosophical meaning of landing on the moon. View Mailer’s handwritten manuscripts, research materials, NASA photographs, and notes concerning “Of a Fire on the Moon,” all from Mailer’s archive at the Ransom Center. The collection, which includes materials associated with all of Mailer’s literary projects, whether completed or not, contains more than 1,000 boxes of materials and is available to researchers, students, and the public. Early eighteenth century graveside scene at Mitchell Ridge by artist Frank Weir. Many of the artifacts featured are from the Texas Archeological Research Laboratory (TARL) collection. Other new online exhibits feature prehistoric coastal cemeteries with unusual grave offerings, shipwrecks and native fishing camps. In 1909, American architect Frank Lloyd Wright produced Ausgeführte Bauten Entwürfe von Frank Lloyd Wright, a folio of 100 plates published by German architectural publisher Ernst Wasmuth. The Special Collections at the Architecture and Planning Library hold several versions of the work– from an original 1911 edition to multiple copies of the 1963 American edition, Buildings: Plans and Designs, published by Horizon Press. The work includes detailed drawings of Wright’s commissions up to 1910, illustrating his early architectural style. The Wasmuth portfolio, as it is now commonly known, contains plans, sections, perspective views and interior details of seventy-three of Wright’s buildings, including Frank Lloyd Wright’s Studio (1895), Unity Temple (1906) and the Robie House (1909) in Oak Park, Illinois, and the Larkin Company Administration Building in Buffalo, New York (1904). The Special Collections at the Architecture and Planning Library contain materials that are fragile, rare and historically significant. Many resources on Frank Lloyd Wright have come to the library’s Special Collections through gifts to the Alexander Architectural Archive. One of the copies of Buildings: Plans and Designs came to the library through the Edward Duke Squibb Collection. Architect Karl Kamrath’s 2007 donation of more than 200 books and periodicals greatly increased the Architecture and Planning Library’s holdings on Frank Lloyd Wright. It recently acquired the manuscript collection of Frank Lloyd Wright scholar, William A. Storrer. Copies of his publications on Wright include: The Architecture of Frank Lloyd Wright: A Complete Catalog (1973), The Architecture of Frank Lloyd Wright: A Guide to Extant Structures (1980), and The Frank Lloyd Wright Companion (1993). The archives are the largest such resource in Texas, containing more than a quarter of a million drawings and more than 1630 linear feet of papers, photographic material, models and ephemera, representing thousands of projects in Texas as well as New York, Chicago, California and Great Britain. Wright related materials are included in the Queen Ferry Coonley, the Karl Kamrath, the William A. Storrer and the Edward Duke Squibb Collections. Written by Katheryn Pierce, Graduate Student in Architectural History at The University of Texas at Austin. In 1577, Spain’s King Phillip II ordered a comprehensive survey of the New World. Questionnaires sent to Spain’s territories in the Americas requested information about population, languages, terrain and vegetation. Of the more than 200 hand-drawn responses, called the relaciones geográficas, one-fifth reside in the Nettie Lee Benson Latin American Collection at The University of Texas at Austin. The relaciones geográficas are just a few of the many priceless artifacts acquired by the library since its establishment in 1926. Today, the Benson Collection is the largest university library of Latin American materials in North America, attracting scholars and visitors from around the world and providing essential support to the research and teaching of the Lozano Long Institute of Latin American Studies. The collection’s curators acquire and provide access to materials on Mexico, Central and South America, the Caribbean and the Hispanic presence in the United States. The delicate condition of the centuries-old maps means they are not publicly displayed, but the helpful staff of the Benson library will show them to interested visitors. Just head to the rare books section and ask to see the relaciones geográficas. Several images of the maps are also available online. The oblong decoupage book features more than 40 pages of carefully cut-out and assembled engravings from books, all embellished with hand-colored drops of blood and religious commentaries (see inset). The emphasis throughout is on images of the crucifixion, birds and snakes, all dripping with blood. Learn more about this odd and rather grotesque precursor to modern-day scrapbooks in the “Insider’s Perspective” story from the February issue of the Ransom Center’s eNews. The Mystery of the "Victorian Blood Book"